Let’s face it: people make mistakes. The problem is that when people make mistakes with tattoos, there’s often very little sympathy for them. After all, a tattoo is a decision that one person and one person only can make about their body. It’s a responsibility and commitment that no one else can share. In the past few years, there have been a handful of different cases where people who had been tattooed with regretable tattoos were turning around and asking for help in getting them removed. Everyone from former gang members to neo-Nazis on trial have made this request from an understandably unsympathetic public. But sometimes the public is listening and sometimes the public does decide that they want to overlook the initial responsibilities of a tattoo and help someone out. Carl Drewett, a 29-year-old former skinhead from Christchurch, New Zealand is getting a second chance thanks to a handful of concerned citizens. Drewett was imprisoned at the age of 23 and had the word “Skinhead” tattooed across his forhead. Today he regrets the tattoo and wishes to turn his life around, having apparently abandoned his former beliefs. ‘Drewett, 28, was trying to raise money to remove his “Skinhead” tattoo so he could start a new life. Things didn’t really progress until a local radio DJ decided to get in on the fundraising. Simon Barnett donated $2,000 to Drewett in order to help him with the cost of tattoo removal. 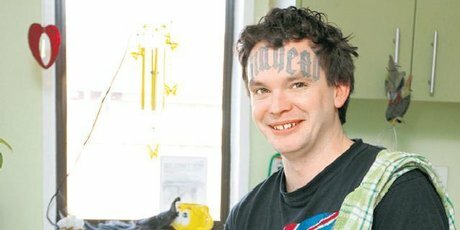 With his donation, Barnett, who feels that Drewett is a “genuine person”, has helped to amass the majority of the $2500 quote that Drewett received for getting his tattoo removed. “When I talked about it on air it really bugged a lot of people who didn’t think he should be helped. “People were saying he’s got himself into this mess he’s got to get himself out of it but sometimes how do you get yourself out of a situation if you don’t have a hand-up,” Barnett said. “It annoys me that people cast these people aside. Nobody is prepared to give them a chance. “We all make mistakes. My feeling is that this guy is really trying, from what I can gather, to get his life sorted out. “He doesn’t subscribe to the belief system he had when he got the tattoo done. “He’s tried to disassociate himself from his former crowd. Whichever way you look at it, it’s a big gesture on the part of Barnett, one that most people wouldn’t even consider. Hopefully Drewett makes it all worthwhile.